Like a scientist, research is part of the work of an artist. A special part of being an artist is that research is done through making. Part of my work as a graduate student is to hone the practices that help me make in my own style and with productivity, to expand MY practice as a work habit; to do my work, because it is research. In addition to consistently practicing my physical making capabilities, research habits may include doing things which invite curiosity or perspective shifts, rumination and play, reading on special topics, going outside of routine, managing a routine, reflection through making, reflection through not making, and cultivating questions. I do believe that, for our general American public, research is not associated with the work of being an artist because the emphasis on making art is usually associated with the value of expressing feelings, or, expression of feelings through the act of making. However, for a visual artist who is working as an artist, making is research. The people the hardest at work as artists are also often reading, writing, tracking down information, communicating with other artists across the globe, constantly increasing their skills and information about processes, ceaselessly searching for opportunities, and it’s exhausting. That’s not even the half of what artists do and don’t get recognized for, but the most important part of our work is research. 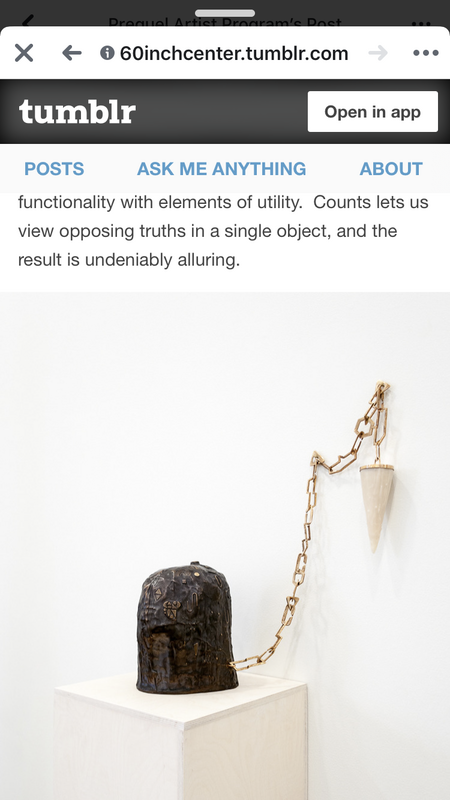 For the visual artist, research is synonymous with making. Making is research. When exercised, the results of making are the complexity and content of our work over time, which can affect the fields and practices of design, science, and philosophy (to name a few), shift cultural expectations and morés and change the course of our history as a species. As you can see, artists’ research is pretty important. This week has meant more research in my materials, specifically porcelain; and research with surface manipulation, particularly how to combine image-making with surface; and, research about the concepts of light and subject through considering the properties of light in photographic capture (what light means as a subject). I am considering how to best combine these materials for communication of a concept. I am considering the essential characteristics of these materials as well as their innate language and historical connotations to allow and communicate meaning in my work. While I obviously enjoy thought-based research, these thoughts must become a material object which communicates to other viewers. 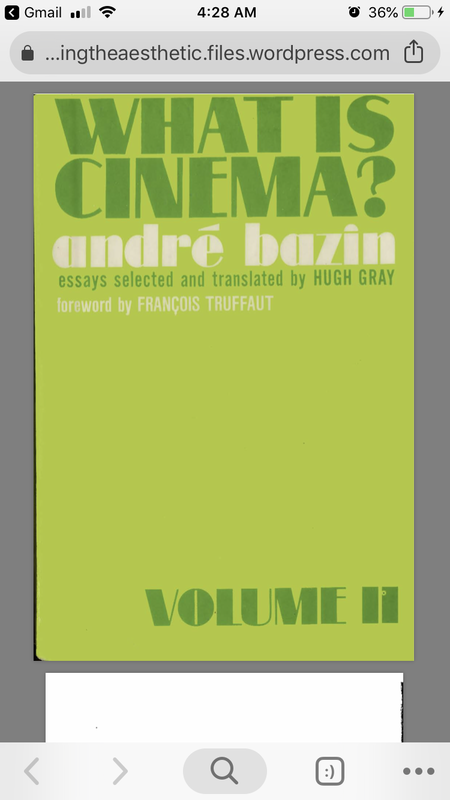 In order to communicate, I make an object which has been considered, even if I do not know the answer to the question, and in making, I find more questions to approach through making. With that consideration of what light might mean, I work in my photography practice, my sculptural practice and my practice of painting or drawing. 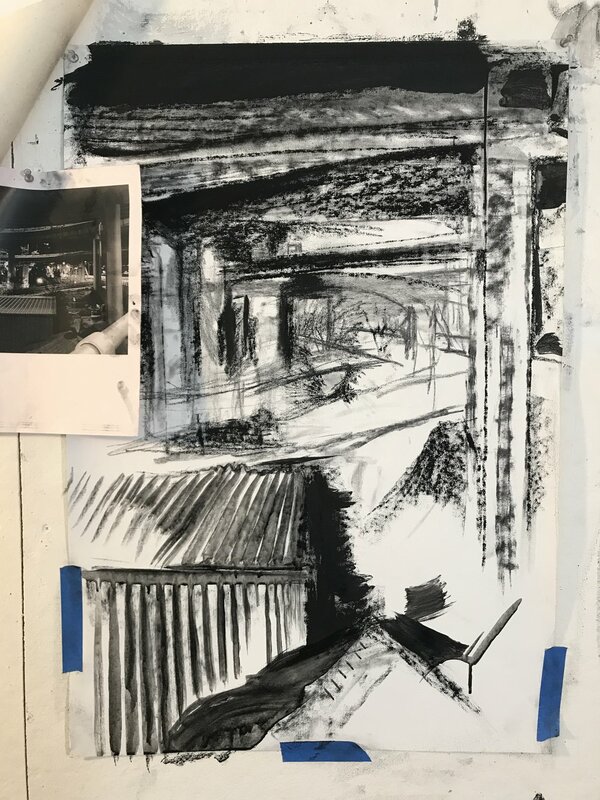 I go to the studio see what happens when I make using artistic research as a way to explore light and shadow. With these thoughts on one hand, I make movements using materials which have historical languages, connotations, and future considerations. 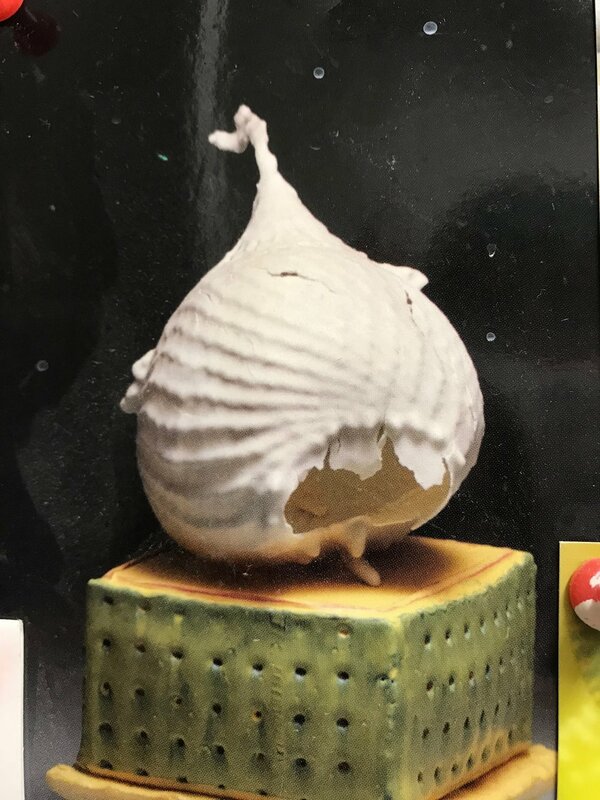 As I am working with the porcelain, I am working to combine consideration of what a form is in relation to an image, because for me, I am considering the connection of light in relation to how we receive and interpret form and image. As I am considering form in porcelain and photography, I am also looking to painting as an historical combination of an object and an image. 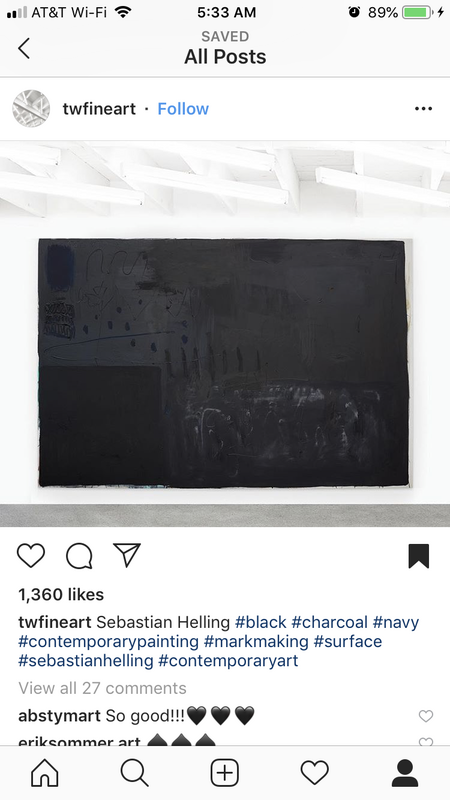 I am interested to take from an object bearing the history of painting (as the traditional bearer of image) and combine it with the material language of object. My current work is to create a canvas out of clay (porcelain) and to combine the languages of image and object. Below is an object which I am drawing inspiration from to research these ideas of the intersection of light and form with image and object. 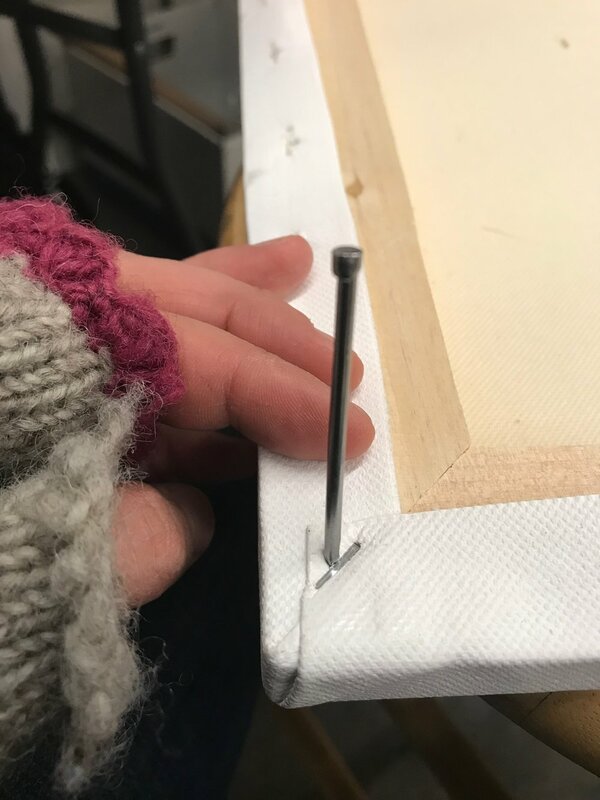 In preparation to make from the interest to communicate an idea, the idea leads the movement of the hand, then the eye responds if the idea is present in the object. (Say what??! ;) Don’t worry, it’s just artistic research). 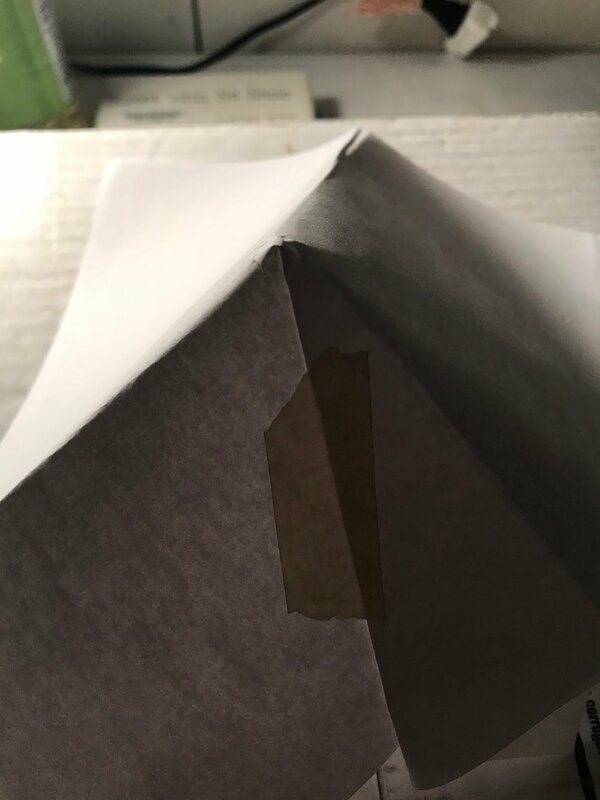 Here is the a step in the research of repeating the form of an object (the canvas with folded corner) to research what happens in an object I make. 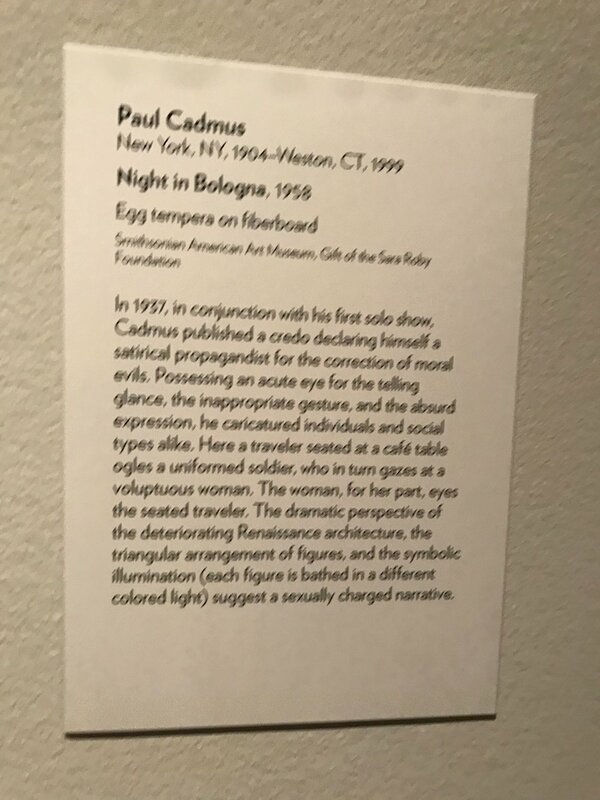 While this may seem like harsh criticism, it is actually a comment on the result of what is present within the photograph, the state of the information which is presented by the image, and insightful consideration of what is present in a photograph of light (or, light as a subject—remembering light as a proof of presence and absence). A “picture of nothing” is the information of a composition based on light. If light is the subject in this image, it is of course an image of nothing, as light allows form and unform. Based on this feedback, I decided to consider what makes an image a picture of something…how to complicate the subject of light. Below are some images I have been considering. These are images of figures (my family), which could give more emotional content than an image of the effects of light in a street without figures. 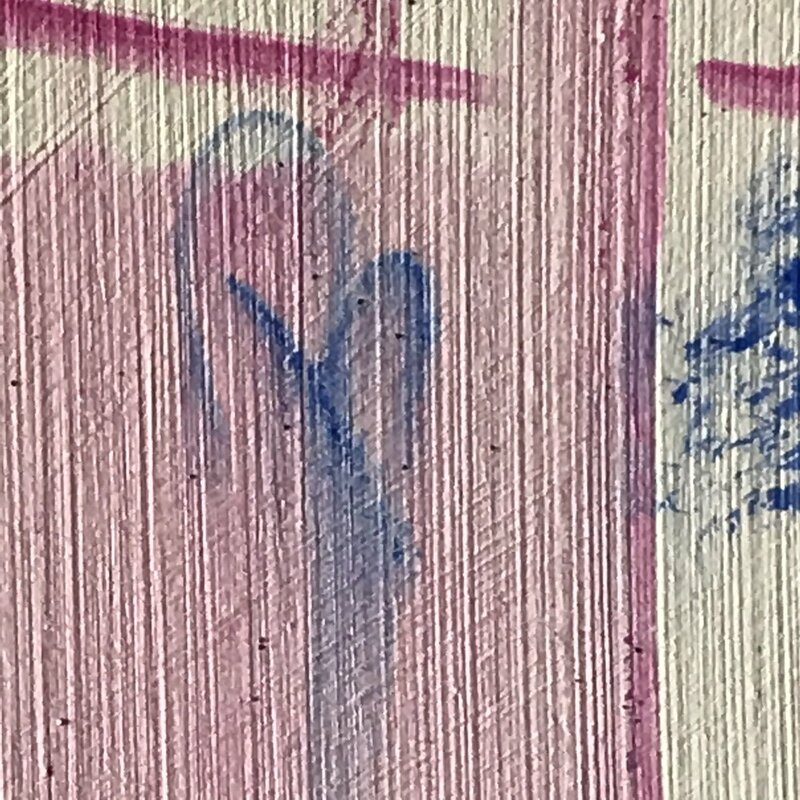 I am considering that the figure may always represent emotion, as we as a species automatically search for emotional communication when a figure is present (my phrasing, but an assertion which I feel can be supported with context from psychology and anthropology of non-verbal communication). 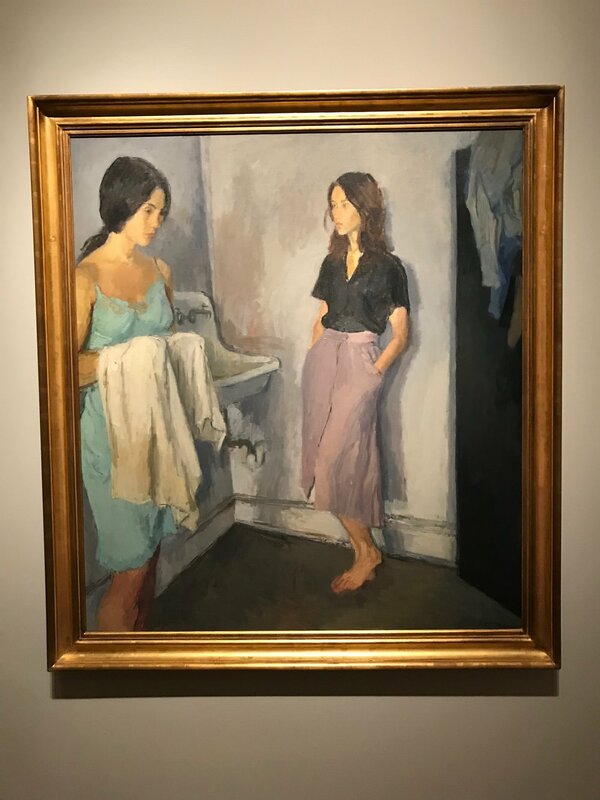 Whether a viewer is aware of the context of the figure may change their interpretation of an emotional context but will not change whether they associate emotions with the figure. Therefore, this picture of my father may not mean the same thing to another viewer, but they will still associate some meaning and emotion with this image of a figure. Although both images would be made possible by light, this is a different type of image for a viewer than an image of a street at night. What is interesting for me in terms of research on image is that 1) they are in black and white, and, 2) they are on a contact sheet. Black and white for me remains a way to visually communicate the most extreme vision of what we experience when we visually register light (contrast). This is important as I continue making images and objects. In the second point, the contact offers the visual language of multiples. The multiple is important because it signals meaning in a way that a non-repeated image does not. A serial image imparts a meaning which is not present when a figure or image is represented once. The meaning is something which I can investigate in sculpture and in image. Moving back from the sympathetic response to figure (in any medium), I look again at what light means in a low-light situation like my photographs at night. 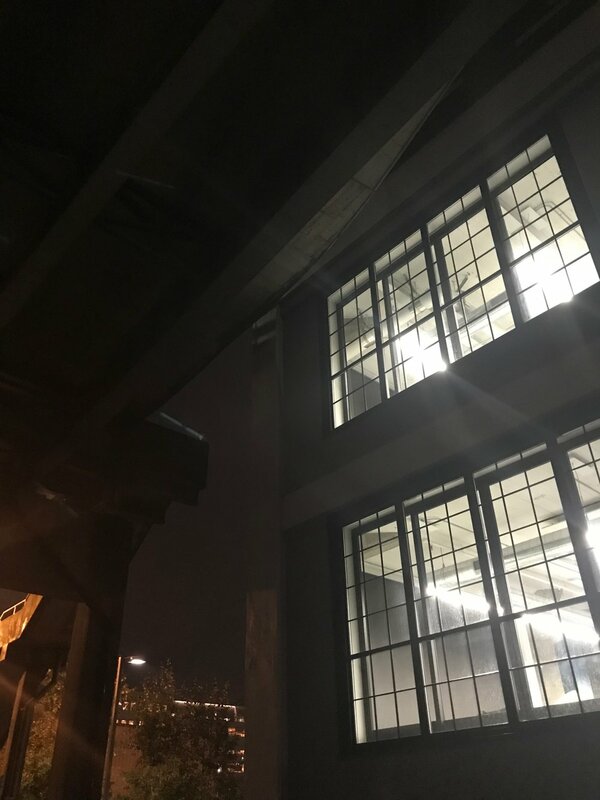 A contemporary urban scene at night can actually include a lot of light because of electricity, and effects are heightened due to lack of an atmospheric light source (the sun). This makes the capture of light at night a potential exercise in regarding the behavior of light at a particle level. 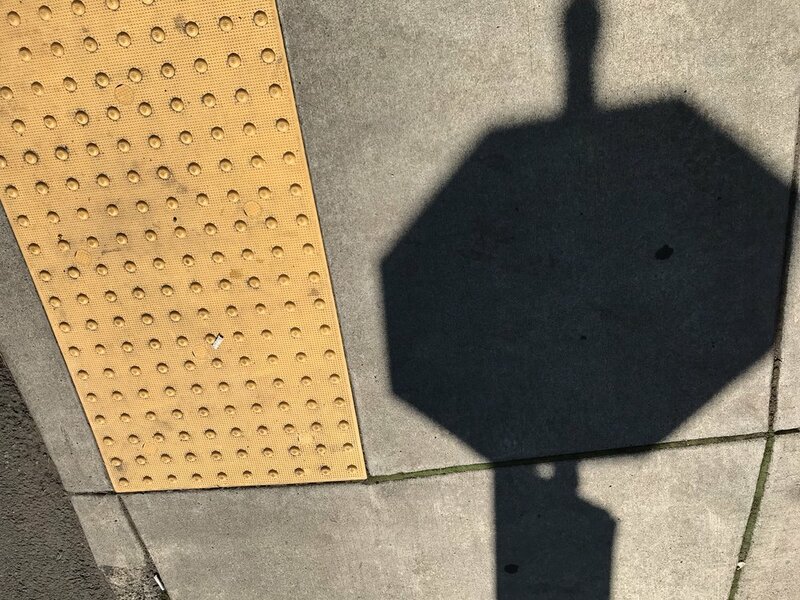 For instance, shadows become enhanced, and forms become even more or less defined because of your distance to the object (as usual but to an ever greater degree). Also, through a photographic lens, the distance to an object and the visual effect of a light particle becomes a function of filters (your eyeball lens, and the lens of the camera). Because of this double lens, photography can make the nature of light visible in ways that the naked eye cannot (without the benefit of the shutter, lens and register present in a camera). 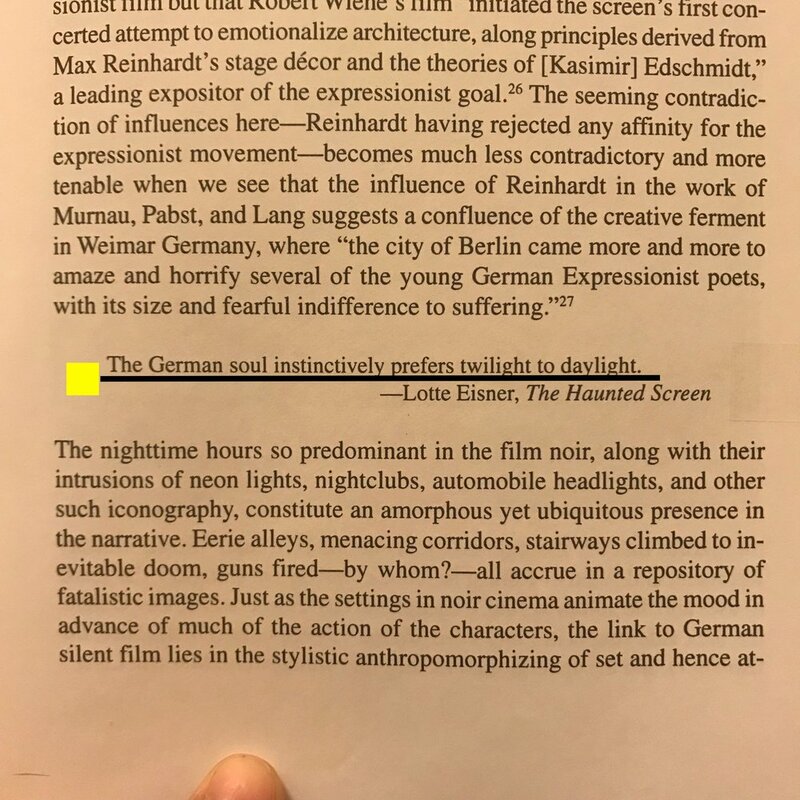 This is interesting because if I can understand the physics of a scene lit at night, I as a maker can more effectively make decisions about what I make as an image and an object. This study of light effects is also a form of research called observation. 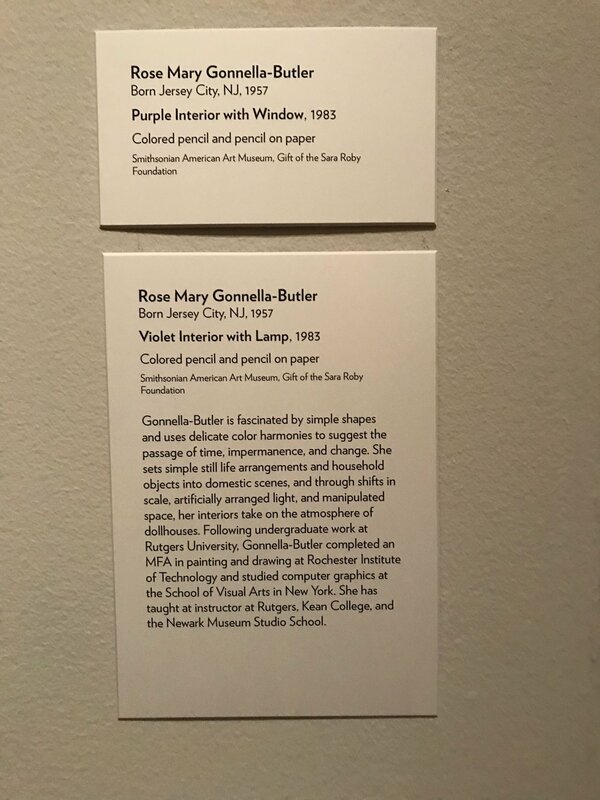 For instance, the following photographs display my observations of the effects of light and shadow in making an object appear to have three dimensions. These effects become important in mold-making, when considering the dimensions of an object and the orientation a piece will have as the product of a mold. 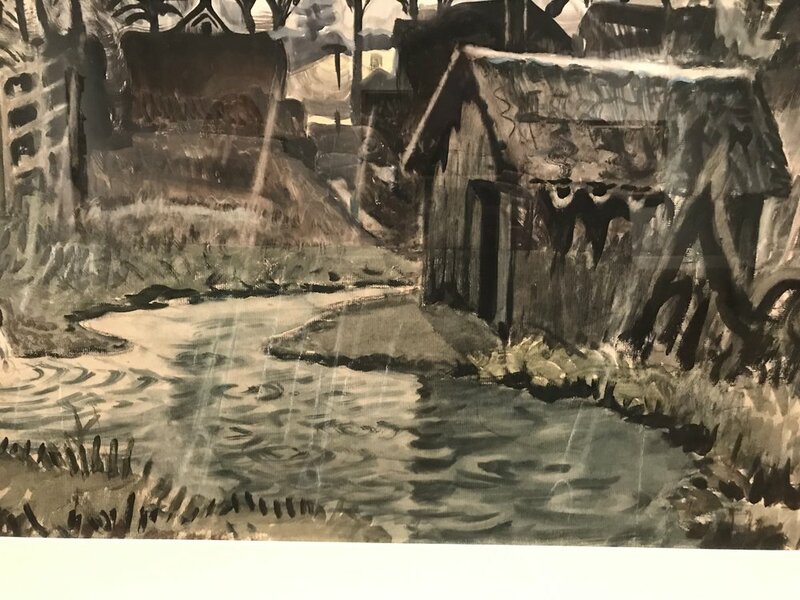 This is part of why I make a practice of studying the light and form in objects and environments: for realistic rendering in plastic form (drawing, painting, sculpture). However, if I wish to emphasize the light as a subject, I might focus on emphasizing brightness and contrast in a field of vision. When looking at these photographs, I am looking at how the light behaves, how the camera has captured it, and whether the contrast or field of vision communicates a sense of something or of nothing (what is the subject of the photographs). If the intention of a photograph is as a document of moment in time, is it a condition that lighting must match the perception of the human eye? In the photographs which follow, I am still questioning what the subject becomes, when light is a formidable aspect of the composition. Is this an image of specific information? Is it a capture of a moment in human cultural history? Is it an image of technology? Does that match what I was capturing with porcelain pressings from buildings? 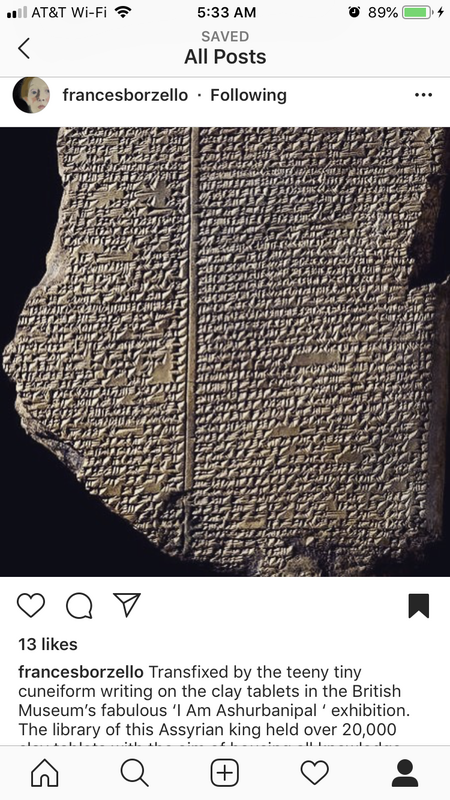 Is an image the same as an object if they both capture a specific quality in human cultural history? The only way to really understand what images and objects are doing is to continue making them. I return to press-molding to make a capture of something which is an object into an object. Here is an image capture of that capture. I think this says something about the act of making and I think I am making work about the act of making as image and object. So then, what happens to an object when it becomes fragments (if it is fragmented, does its operation become different?)? 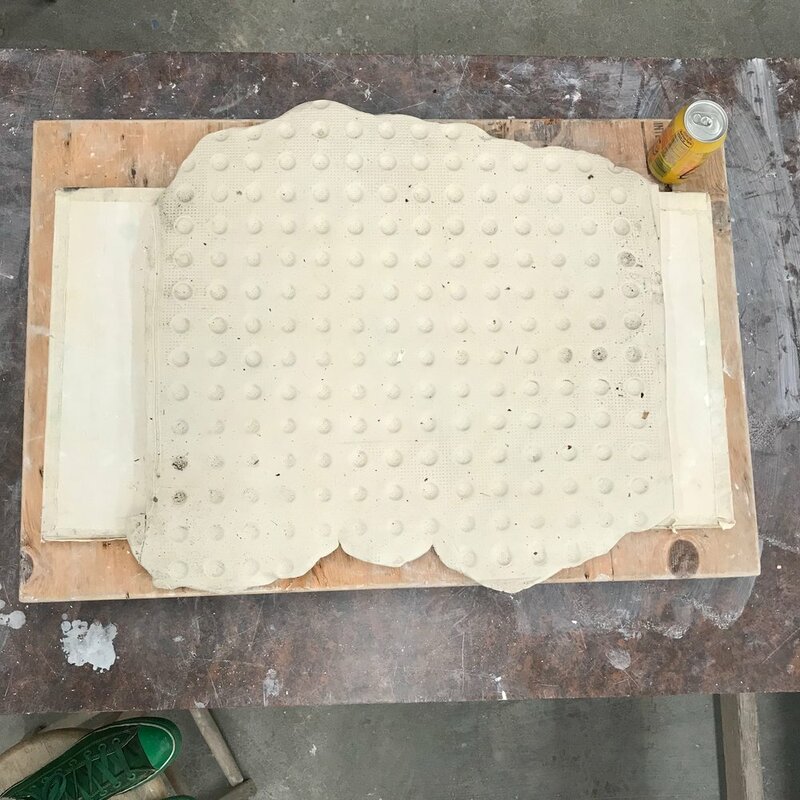 The objects above and below were made using one mold-making method: press molding from an original (above) and press-molding using a tile (bottom of photo, below). What happens, also, when an object is created to replicate the conditions of another object? (For instance, when a sculpture is carved out of marble to imitate fabric or human flesh). 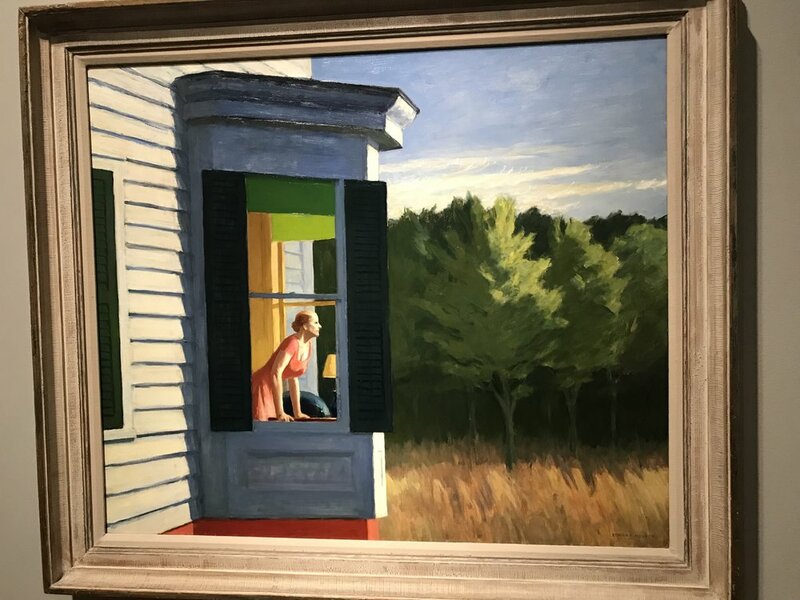 When an object is allowed aspects (shape, form, color, shadow, value) that mimic characteristics of another object, how does communication to the viewer (from the object) become different? These are questions I am working in as I explore how we perceive images and objects. To make images of nothing is to communicate something and nothing at the same time. Only through thorough and consistent making will I have research. Only through research can I arrive to a question. Below are some questions in process. As an artist, I perceive that they present both conditions and questions within their form and structure. I’m hoping to develop them into fully-grown questions (using image, and changing their surface), over the next few weeks. What type of method do you use to develop questions (how are you asking)? How can a practice help you approach asking? Do you understand how practice can be a method of asking and a question? Remember when I went to Eutectic with my mold-making class? Well, a great opportunity came out of that! I interviewed with the directors and owners of Eutectic and Mudshark Studios LLC. and resulted in a two-week, in-house residency. I’m excited for this opportunity to make work on-site that informs my thesis research. I have been prepping materials this weekend for the work I will potentially make starting on Wednesday. I’ll be bringing my trusty-yet-rusty travel easel to do plein air paintings on the production floor of Mudshark, LLC. From Oct 17-Nov 5, I will make work on-site in response to the activity and buildings that comprise Eutectic Gallery & Mudshark Studios LLC. 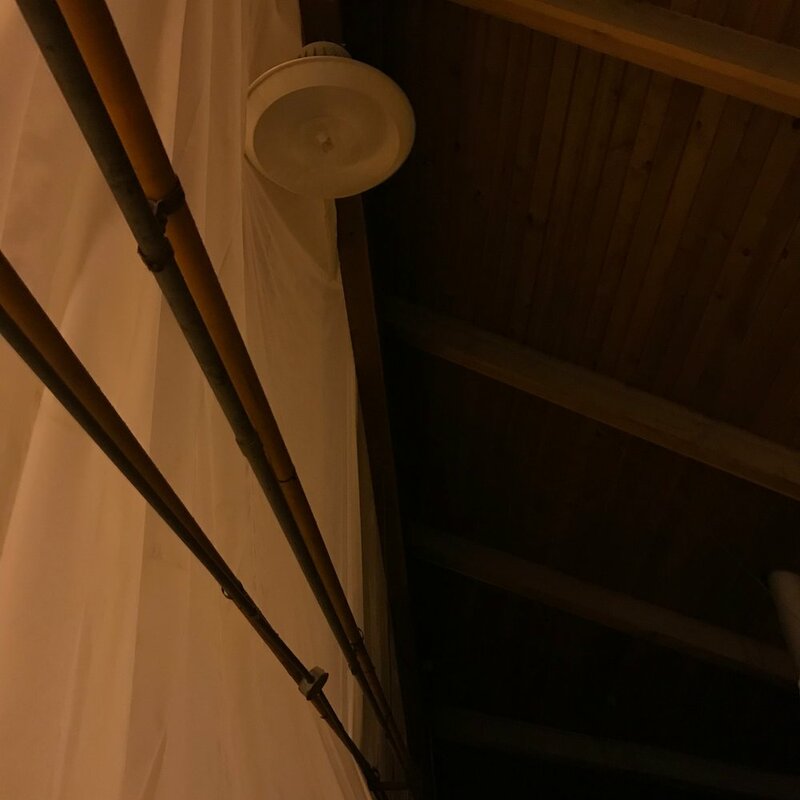 I will have access to an area of the production floor and will make plein air drawings and paintings in response to the activity, the structure of the building and the views outside of Eutectic/Mudhshark. 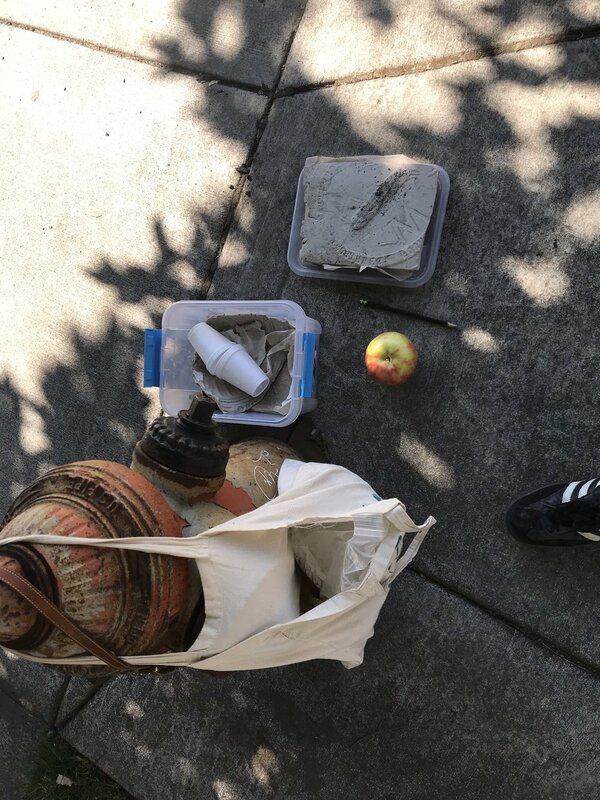 I will also bring porcelain and stoneware to make molds from the gallery front and neighborhood buildings, as they relate to the historical area I have been photographing and making impressions from in ceramic media. This is a perfect opportunity to go deeper with my material studies in both painting and sculpture as the location is adjacent to the area I have studied with pictures and ceramic reproductions, and ties to my thesis content. This experience will allow me to make work that expands the work I have made so far. 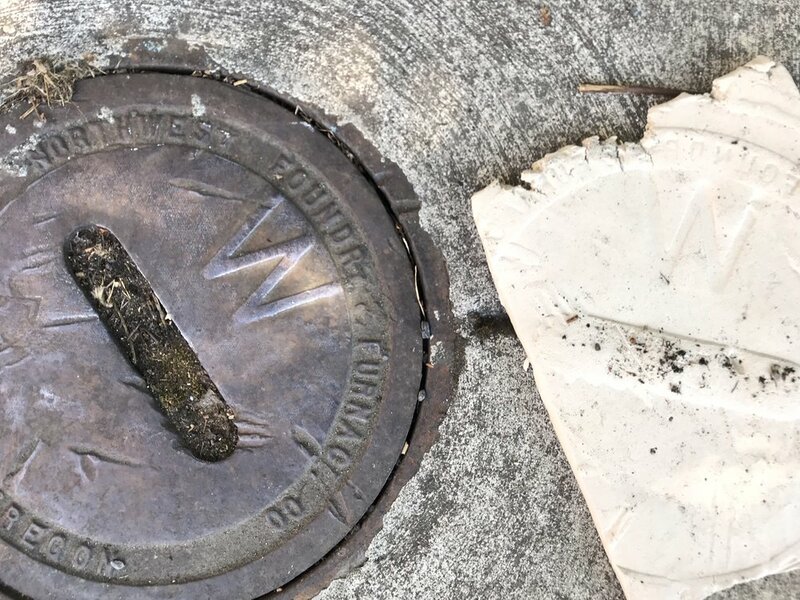 It shares roots in the industrial history of Portland, an area of content I have been focused on in inquiry. 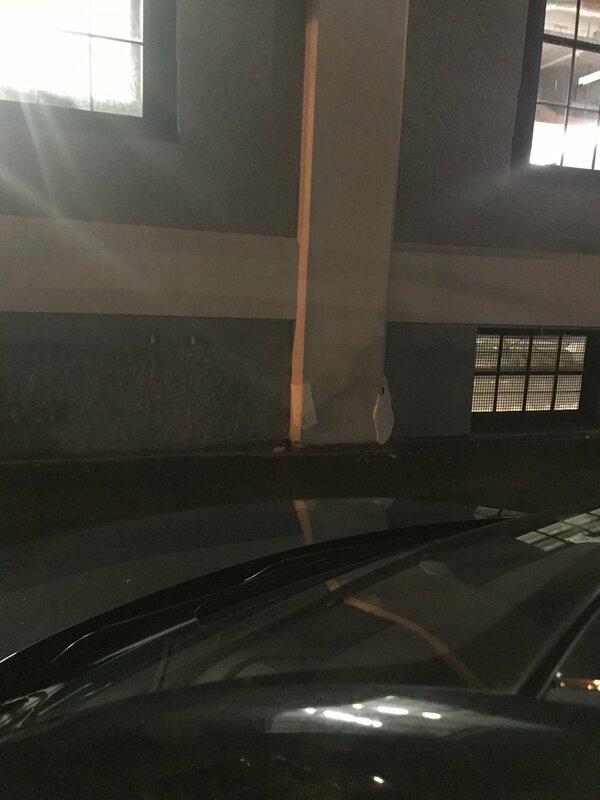 I have collected vistas of the historical buildings at night, photographing the dated structures which hearken to Portland’s early industrial past. 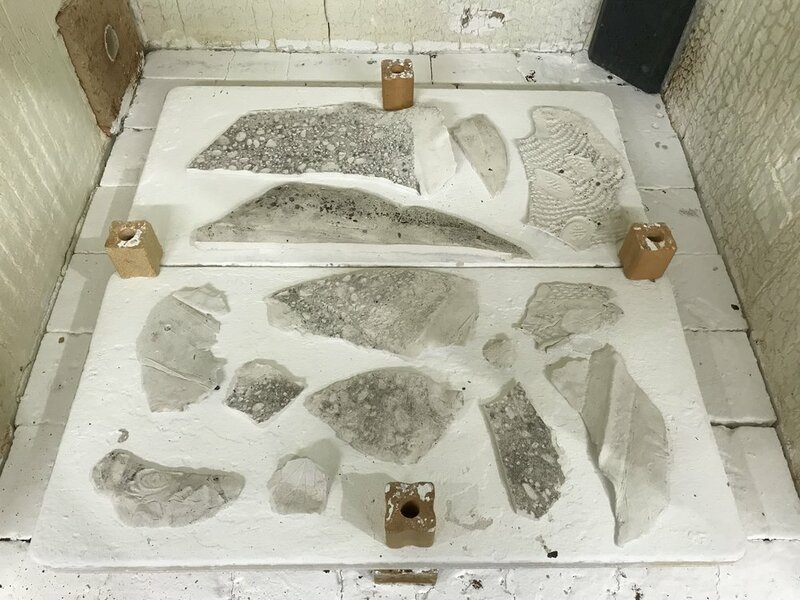 As I have been developing the process of collecting surface information with slab impressions, the opportunity to make work in the same area of town is a priceless opportunity to deepen the content of my work. 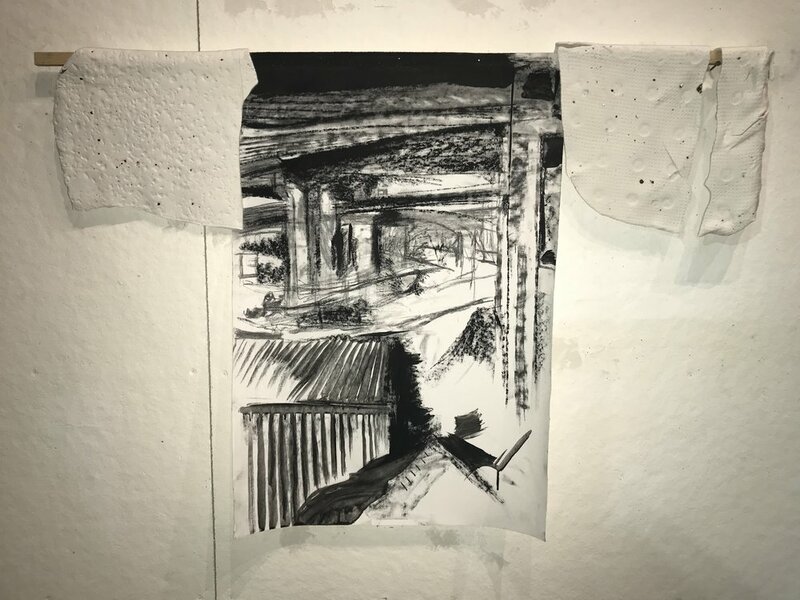 I will be able to spend more time with the area, observing it through painting and hope to discover answers about the aesthetic and process questions I have about using my reference photography and resulting drawings and paintings to create an impression of an area. Whew! I’ve got work my cut out for me, that’s for sure. And I’m hoping to have some fun while I do it. The owners of Mudshark are fun, easy to work with and have unique perspective on being a living part of business in this historical area of Portland. I hope to interview these business owners as a way of gathering additional information about the atmosphere of the area. 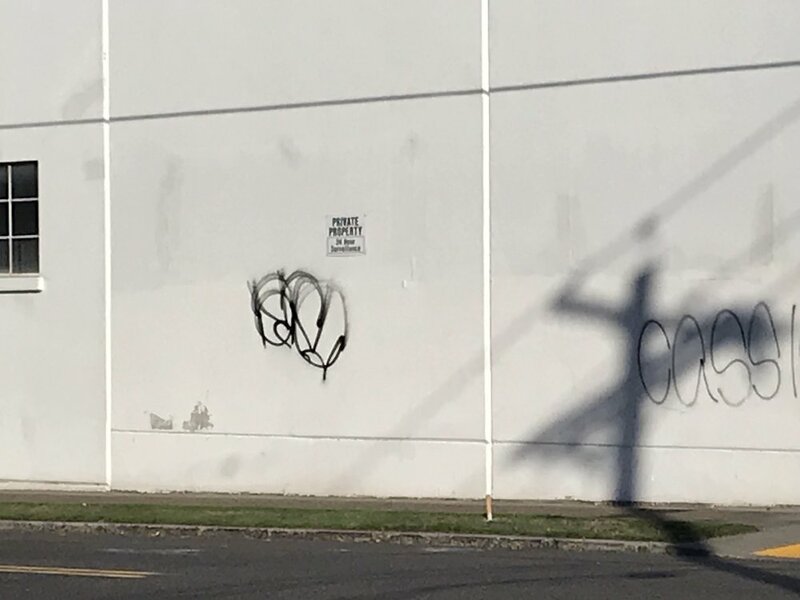 I want to know what they think of its history, present, and future as real users of the industrial area of Portland. I’d like to know what they think the future of this area will be and look like—all which tie to the content of my work—investigating an area between what is past and the present. On the note of content in my work, I did some thinking and development through writing in preparation for the time at Mudshark. I am including my notes here as I will look back on this writing over the next three weeks and hope to make connections between what I am thinking about and investigating while making, thoughts about how artwork functions as documentation of place and time; reality as reflected in presence and absence, nostalgia for a certain history; how making and objects mark and bear our past and present. These notes are a sort of index of themes that relate to what I’m looking at in my work, and I’ll reflect on them as I make work. 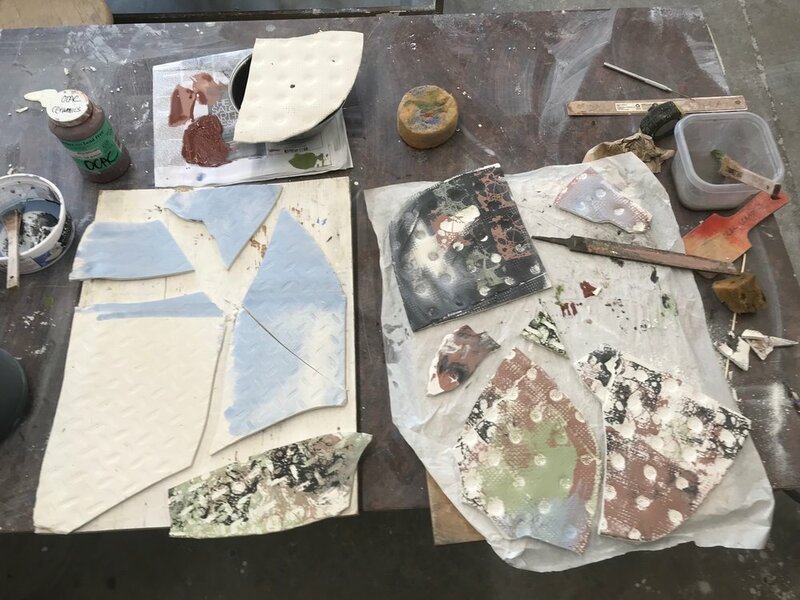 As I am writing this, there are pieces of porcelain in the test kiln which will be finished tomorrow and ready for me to draw and experiment on…masonite is drying and will be ready to sand and re-finish, to take with me on Wednesday. My workflow has become a more regular process of preparation of materials; then, making. I am looking forward, with eager anticipation to this period of making, and the abundance and lights of insight it will no doubt bring. Only through making will I know what I’m looking at. I will have updates of residency work all three weeks, October 17-Nov 5, on Sundays. Last week, I posted about learning to make a one-part mold. 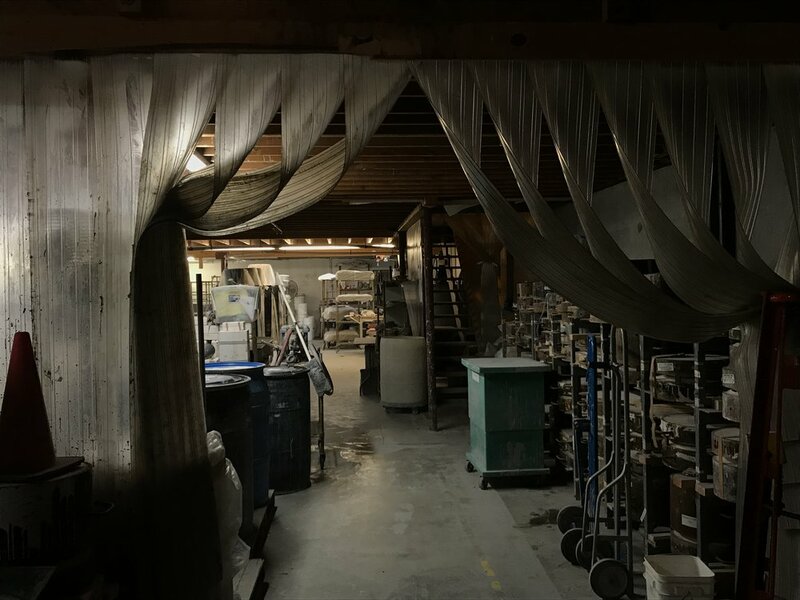 Since then, our class visited Eutectic Gallery, a critical art/contemporary ceramics space in Portland and toured the mold-making business of the same owners, Mudshark. I was so inspired that I started making my pre-planned molds of the streets of Portland the same day. 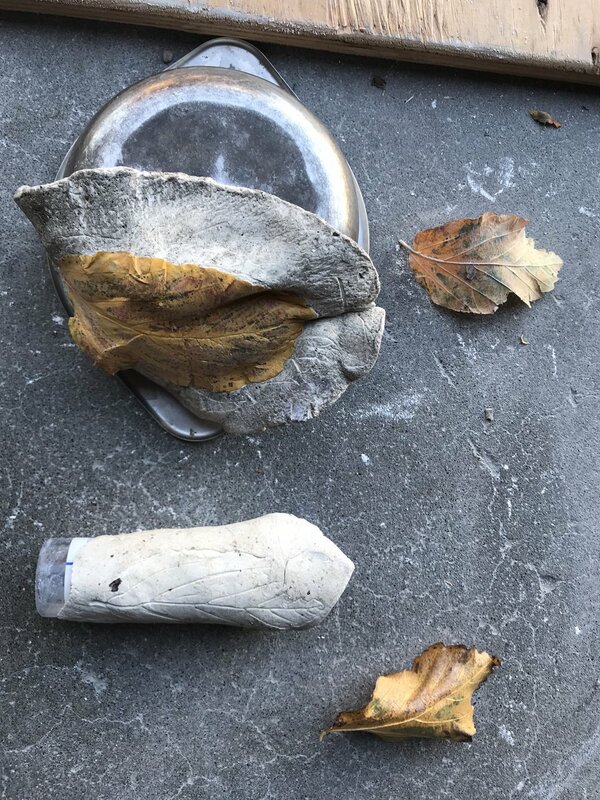 I also started to frost (or, ”glaze,” to the initiated) my first casts of the Monkey Skull and got some interesting findings…both of these events have resulted in pretty fantastic directions, into which I will go in this post! 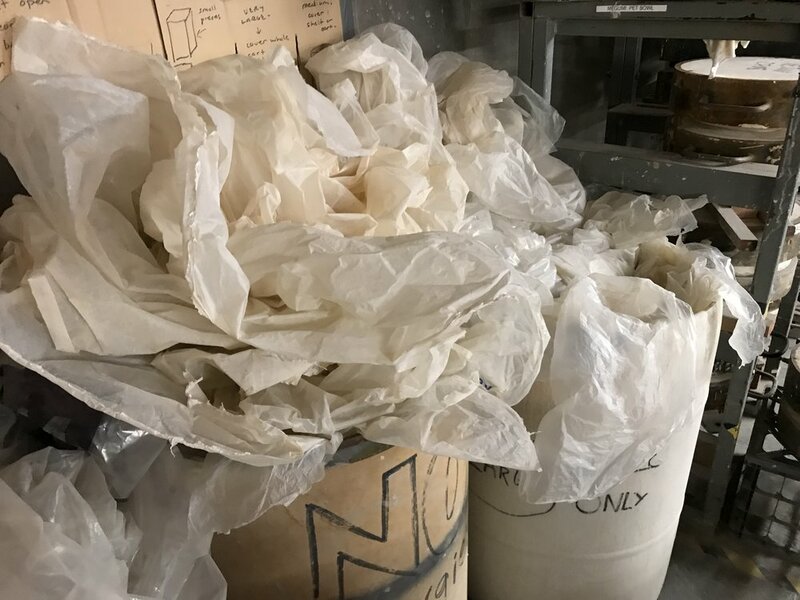 Thanks to our instructor’s connections with the business owners, we were able to meet the owner, Brett Binford and tour the production floor of Mudshark, also their sister company, Eutectic Gallery, which highlights contemporary ceramics artists. 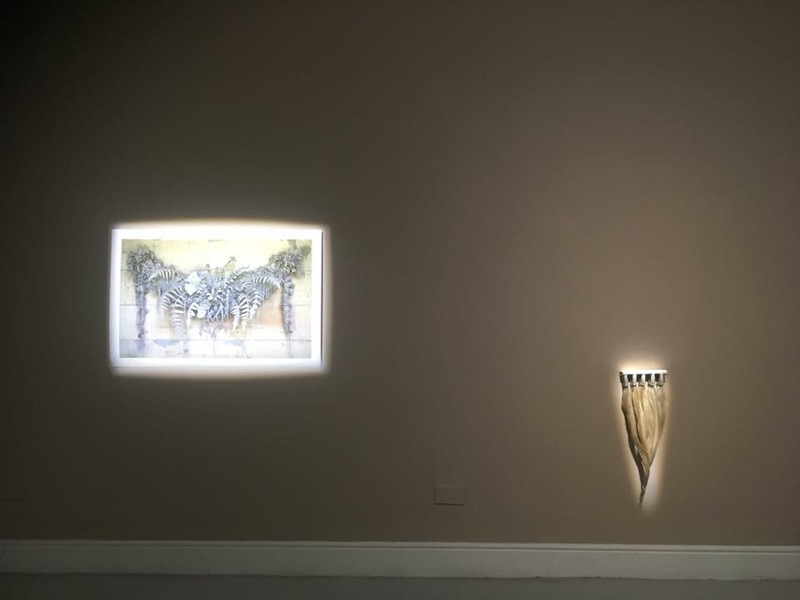 We viewed the current exhibition, About Water from clay artist Susan Thayer (not pictured). This was a most educational and awesome field trip. Let me reiterate: this was an amazing field trip. Not only were we able to see a working craft business in action and the real-life application of the mold-making techniques we have learned in class, but Brett Binford was the epitome of generous and took time with our class to share Mudshark’s history and explain some of the ins-and-outs of building a small-batch craft business from the ground up. It was truly a great educational experience for Craft students who may some day aspire to such successes as what Eutectic + Mudshark have created! 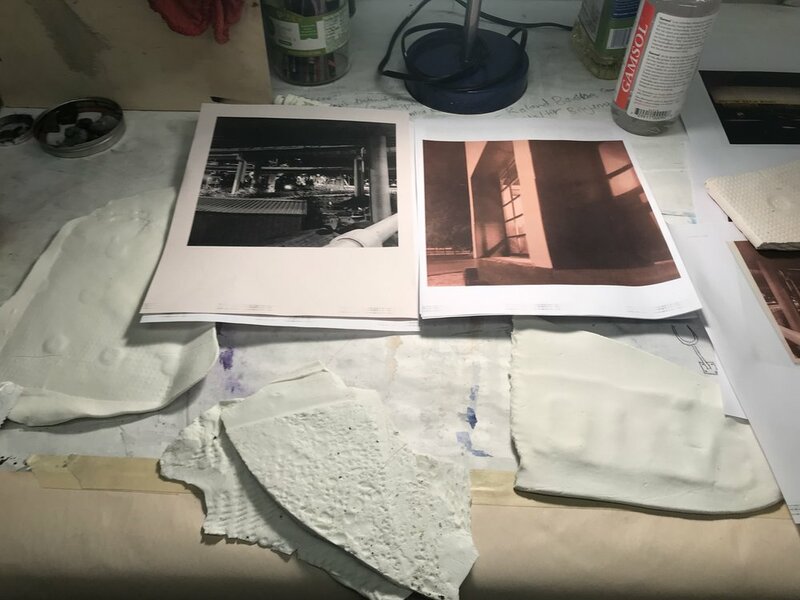 Part of my Independent Study has been development of the idea to use mold-making to enable me to capture part of the streets that have inspired my study of urban Portland areas. Side-Note: I have a love of the manufacturing district around Water Ave. I have already made a study of this area using photo-documentation. I have plans to use these photos, and to interpret the area using ceramics and painting, too. 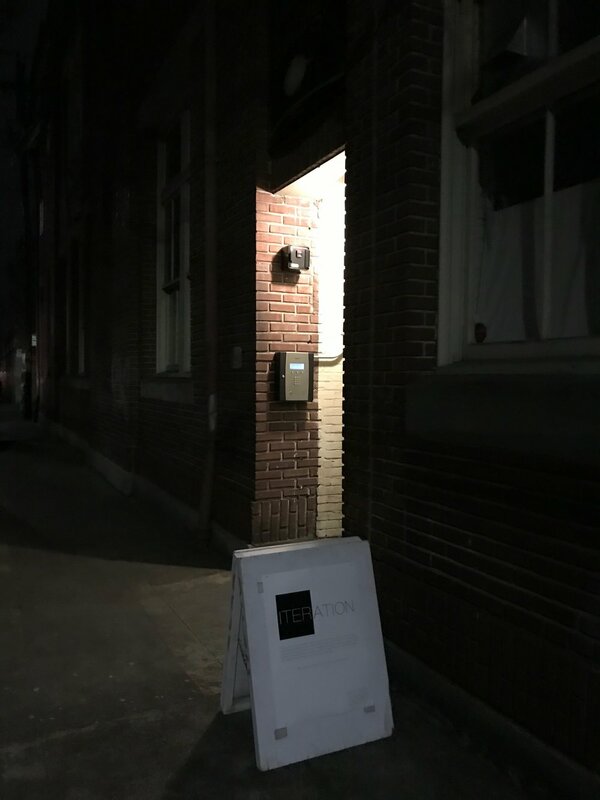 The inspiration is one part element of documentation of an area of the city which has history and is rapidly changing, one part interpretation of the feelings I have when walking through this area. 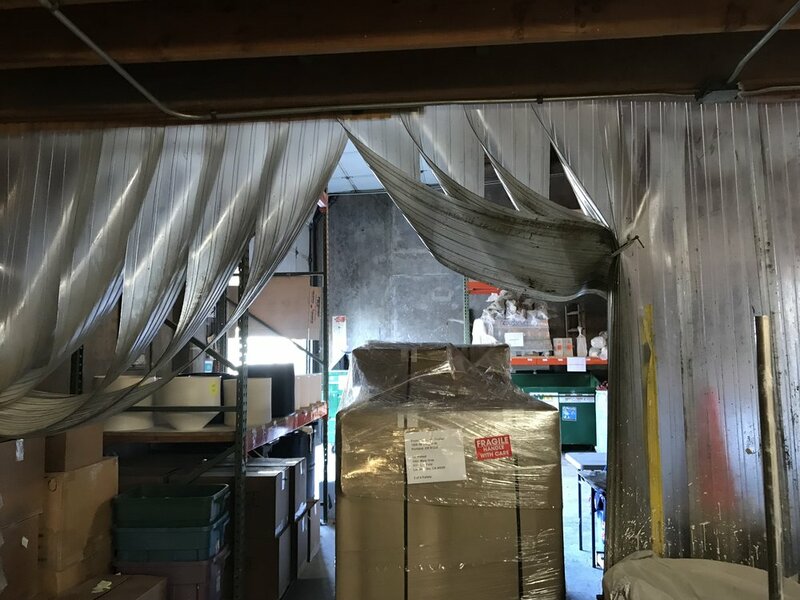 Well, one of the big ideas behind this Independent Study is to learn techniques in mold-making which will increase my abilities to capture this area, to imbue my artwork with the characteristics of the area of downtown Portland. 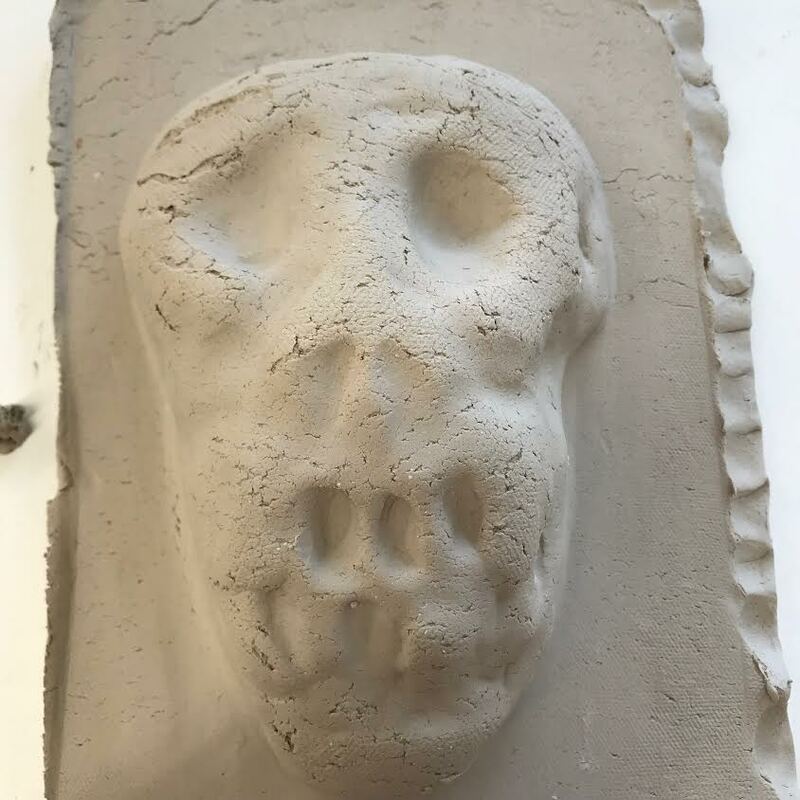 Building on the techniques of tile-making and one-part molds, inspired by the ethic and industry of Mudshark Studios, I have started to apply what I absorbed in mold-making class and had planned as my first iteration in work: making molds from the streets. laying on the ground and pressing clay into the sidewalks. 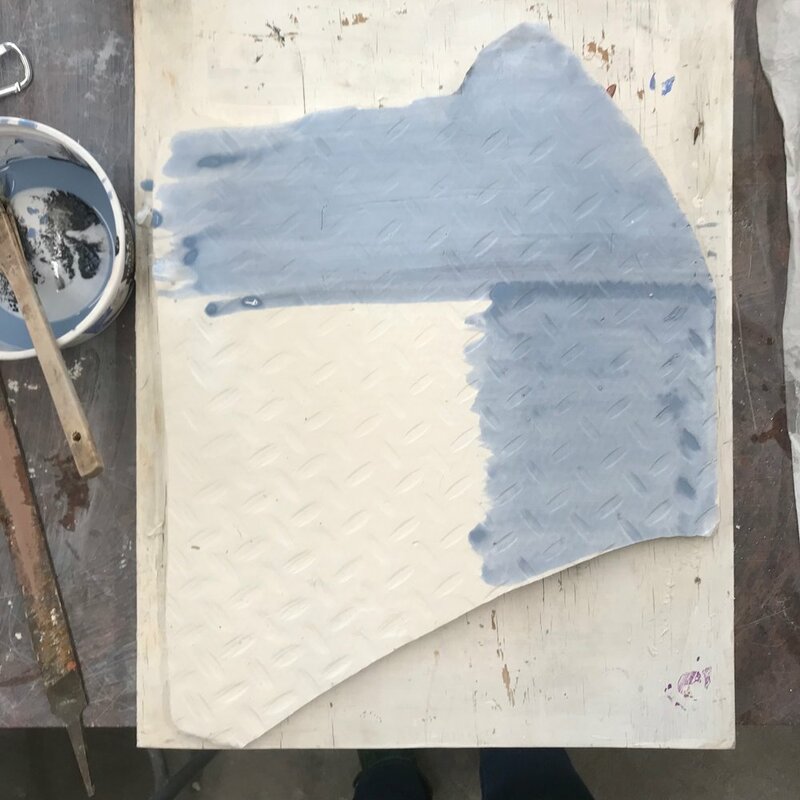 In fact, a crazy person even stopped and shouted, “THIS IS GENIUS,” enamored that I was surrounded with clay tiles and he could see me and what I was doing and thought it was wonderful. It made me want to not stop, having that effect on a stranger with my art-making. This was an unexpected element of this project: that making art in public came with people who would engage me as I did it! They asked me about what I was doing and why, and I had to express my thoughts and tell them what I was doing and why—the singular most complicated part of writing a thesis about my work. I couldn’t have asked for a more compelling way to fully consider what I was doing and why than engaging with people who were really interested by what I was doing, and I am thankful for that. There were many who stopped and watched, then moved along but three people in specific who changed my experience and made me feel like I was following the path down the rabbit hole to doing something right, and potentially amazing. These strangers, although they were just curious, really helped me consider and articulate why I was doing what I was doing. 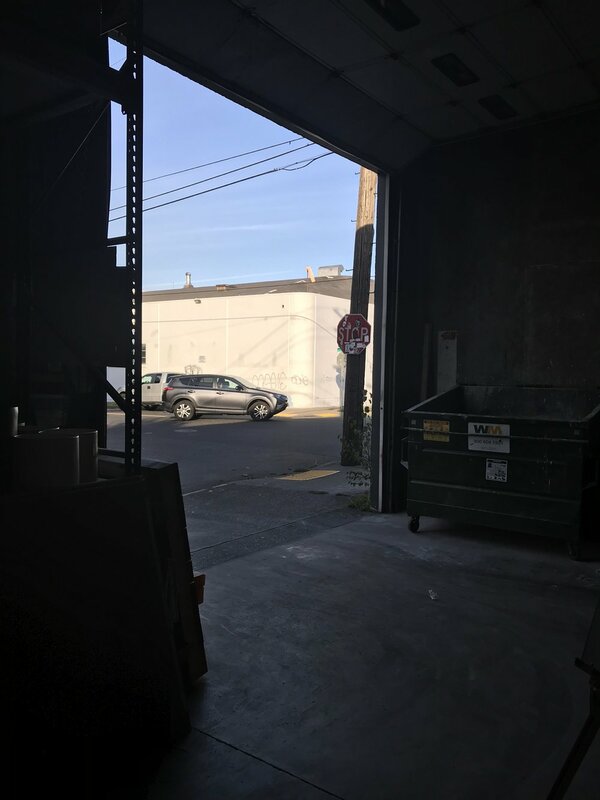 Some of them made observations that helped me answer questions about the nature of my work, like why I was interested to capture elements of the street and why I wanted to share parts of Portland through my work. Some just shared enthusiasm for what I was doing, what I told them I wanted to do with this work, and that it was important to them—to save and remember, too—to capture a part of time and place. I wrote a poem about the experience I had that day. 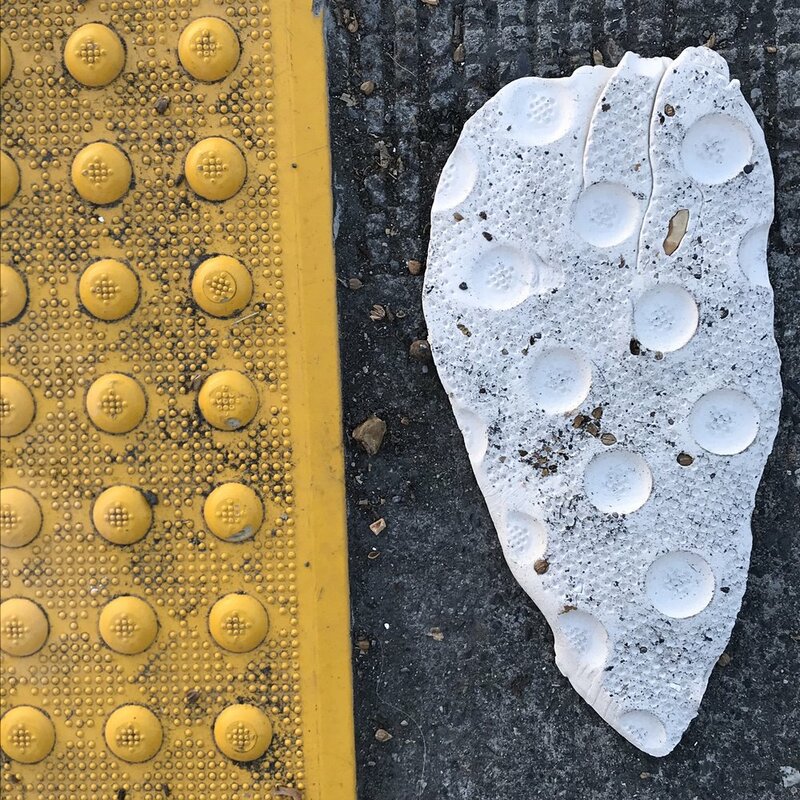 It accompanies these photos as part of the process of pressing clay into the sidewalks to capture impressions as pieces of what I thought could portray the character of an urban space and Portland streets. Some even bear the name of the street. Made a new friend called Mary. She sounds like she has a higher calling. Tool belt must make my belt use the apron from the kitchen. Slip contained in film canister to undo some things done. Water bottle-change my painting box into a toolbox Do It. Pressing molds off 13th & Division. 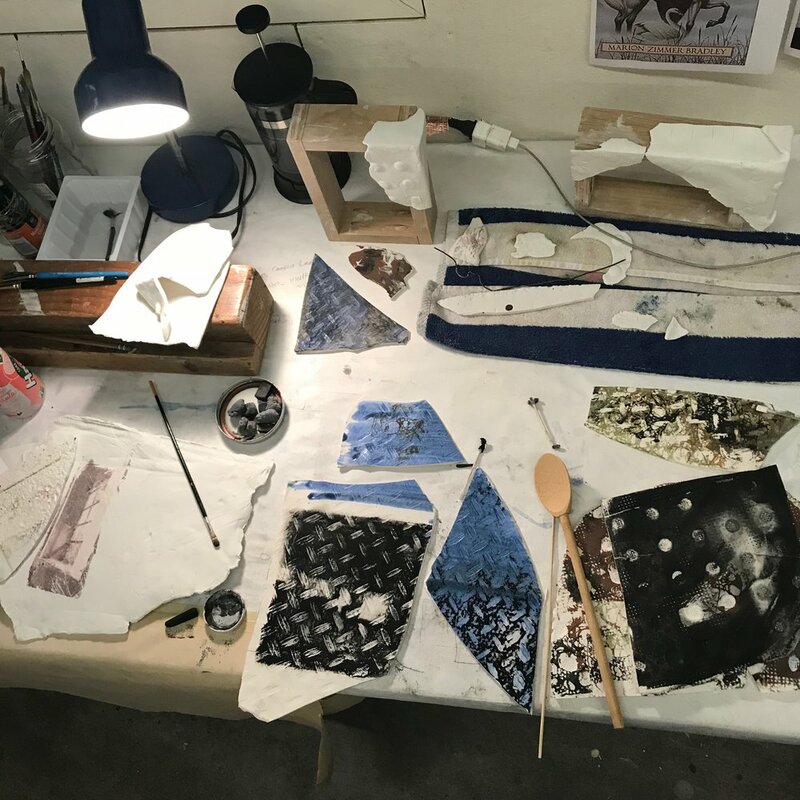 This post continues my moldmaking explorations in an Independent Study at OCAC in the Fall semester of 2018. 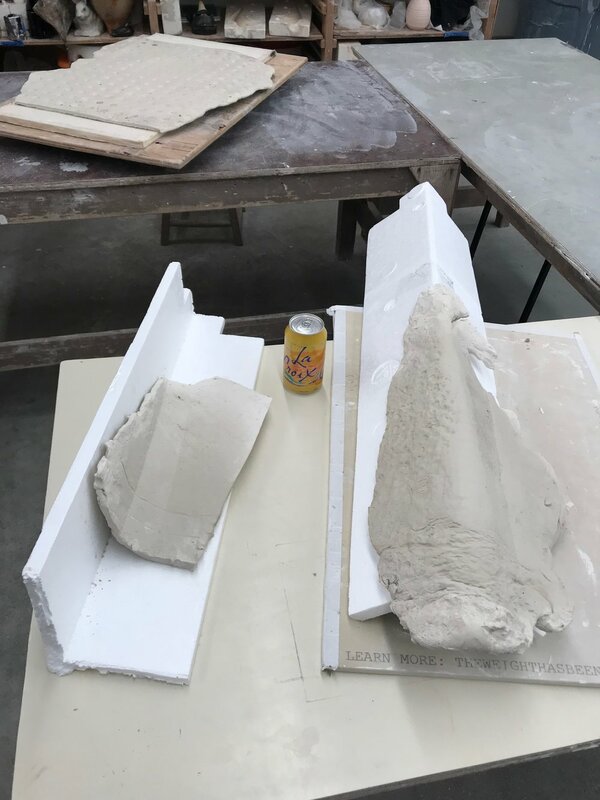 I had some good success learning from these tile molds which objects to use and how to use them to make a good impression, when pouring plaster over a composition. 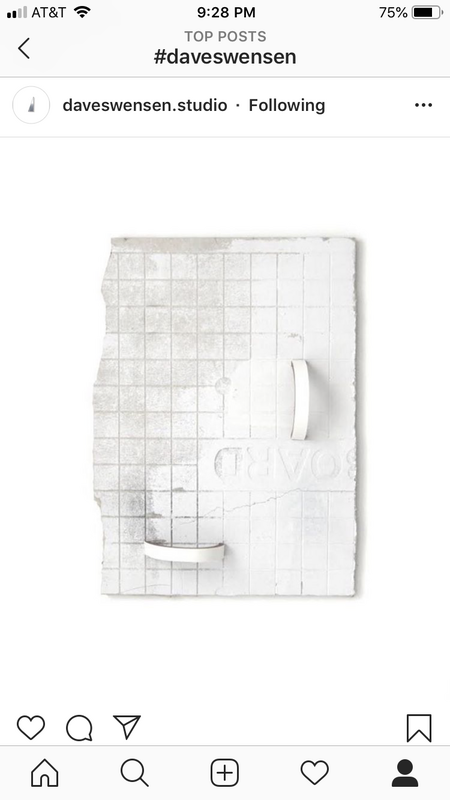 I also learned which objects and orientations have a problem causing “undercuts” as they are covered in plaster. 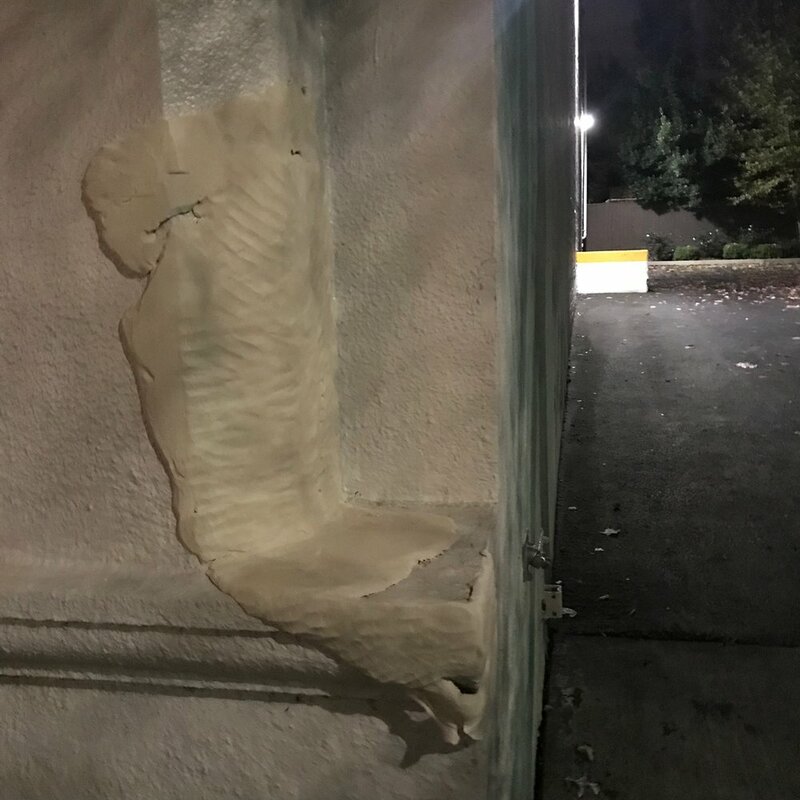 This was a good thing to explore and witness, as undercutting is explained in concept during the orientation to plaster, but seeing it happen really gets the idea set into your brain. 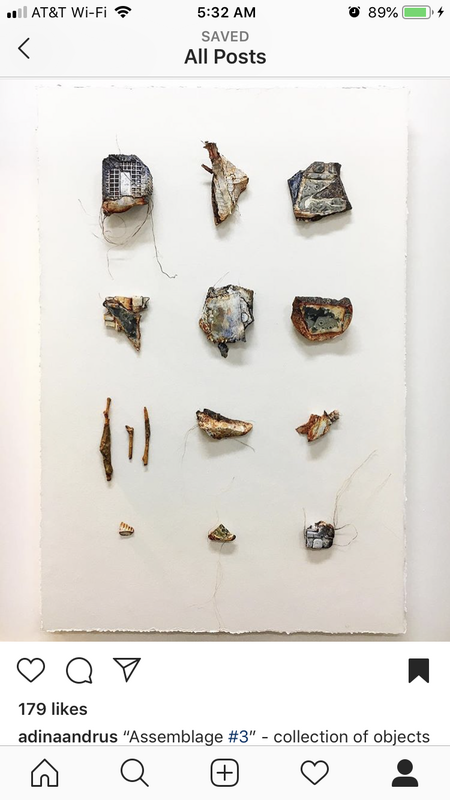 As you can see, some objects like the ball of tape project with too many layers into the plaster and cause an “undercut,” where the plaster settles too far into layers of surfaces and can’t be retrieved. 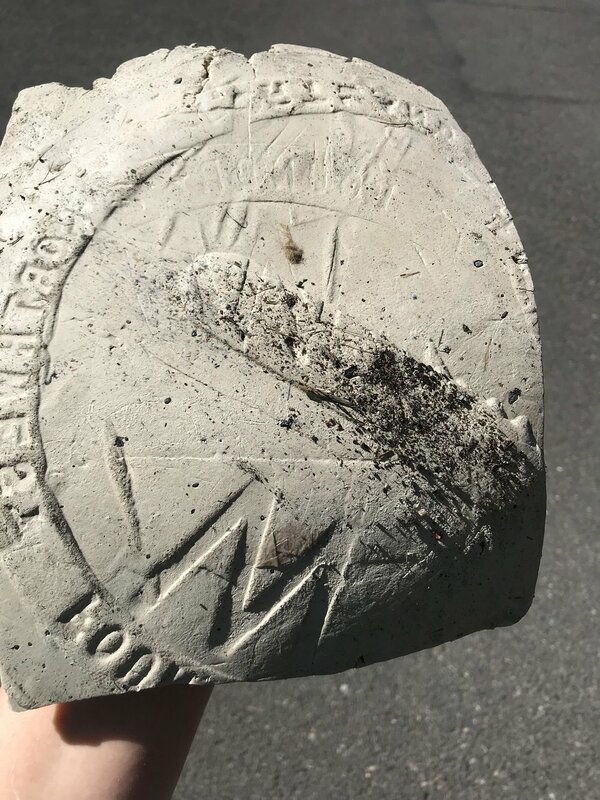 In the picture below, you can see where the plaster couldn’t be retrieved (the plaster still set into clay in the middle of the tape impression). 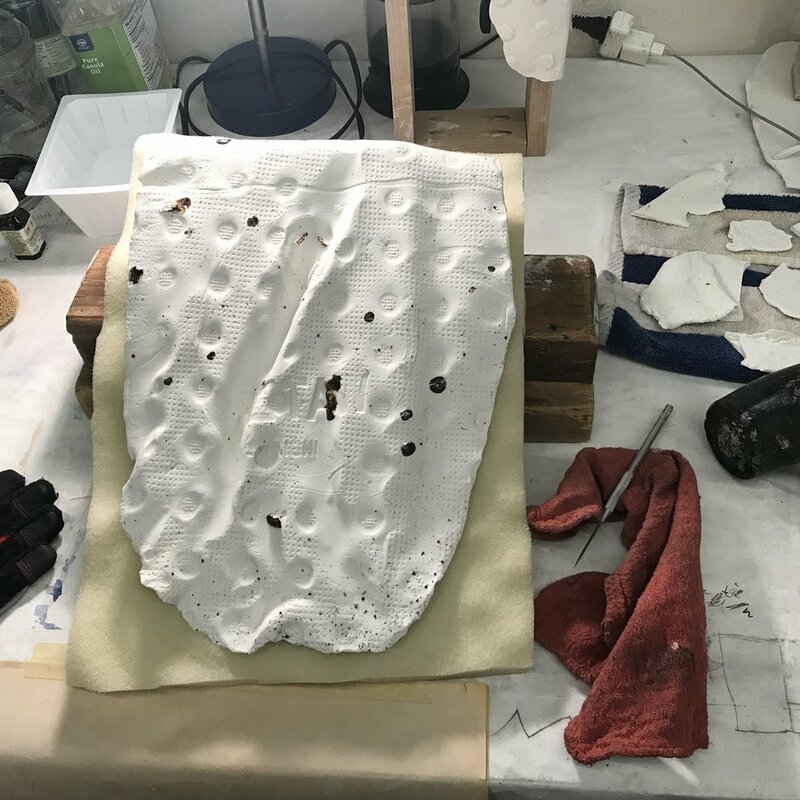 These are helpful lessons to use when visualizing for future originals and to know what the plaster needs to make a successful mold for an object in the round. 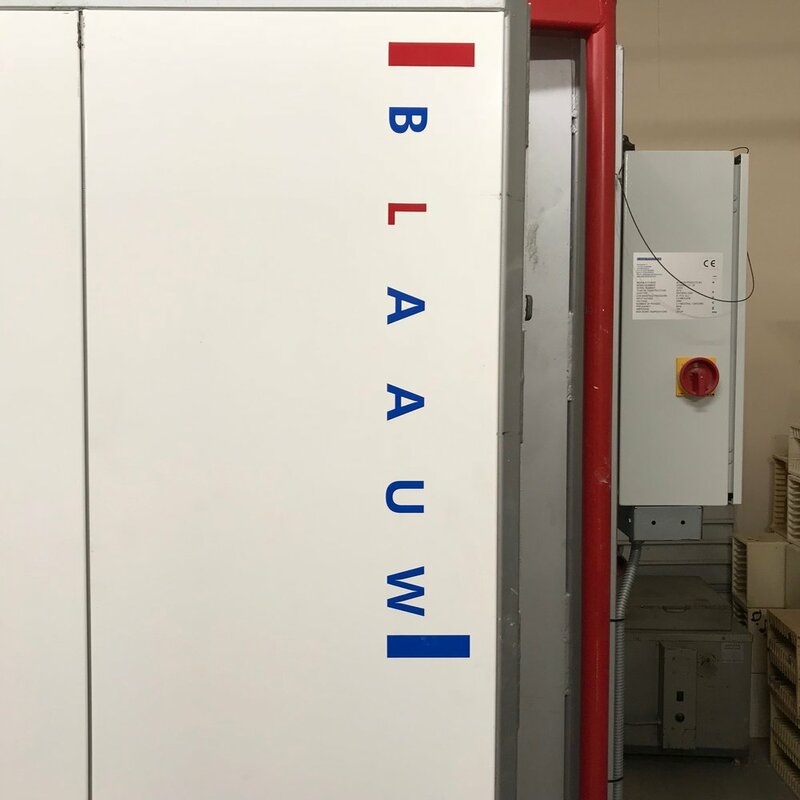 I also observed helpful findings about how to treat a text or word when making an original for a mold, to get the word to come out in the desired direction. 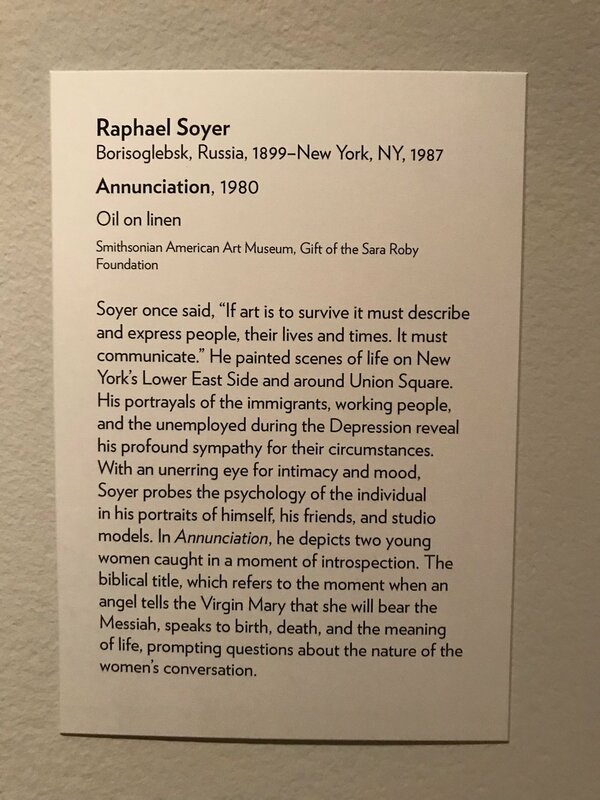 For instance, I was thinking about the text I chose (“SIGNALS”) as I would in printmaking and rendered it backwards for the text to come out with a forward, and legible orientation. However, it turns out that the word impression in a tile is the same as it would be if using a stamp rather than an intaglio impression and did not have to be made in reverse. Lesson learned, if not considered, beforehand. All part of the process of getting more familiar with these processes so that I can make some great pieces. 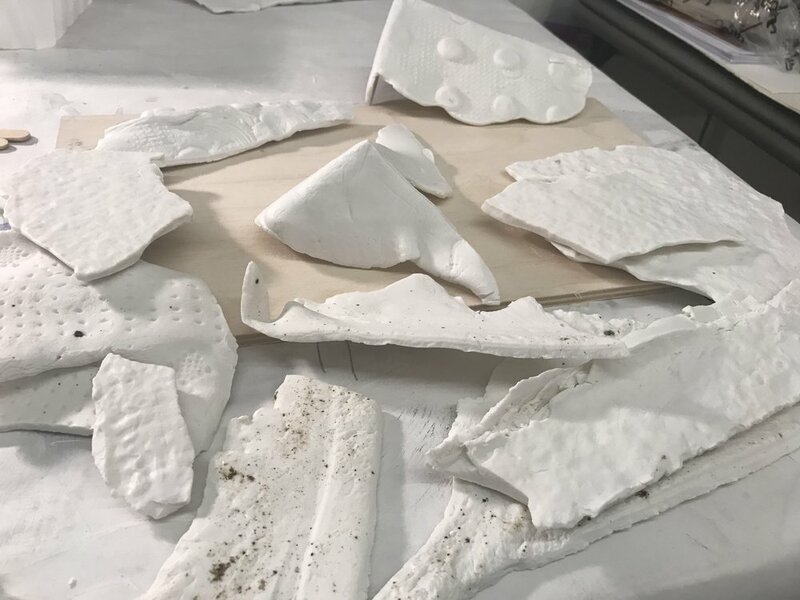 In lessons of surface, the metal of the nut and bottlecap I used did not want to come out of the plaster body despite being doused with mold soap. 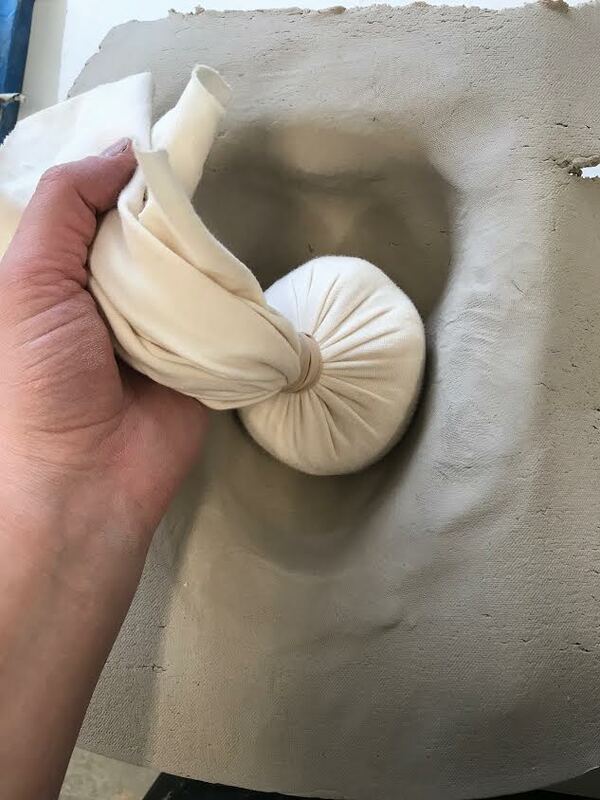 This will be helpful in the future as I am reckoning with what material to use for molds in an in situ process, and so far it seems the easiest yet most versatile material will be clay (I will make impressions in slabs and bring them back to pour from as opposed to possibly using plaster in situ). 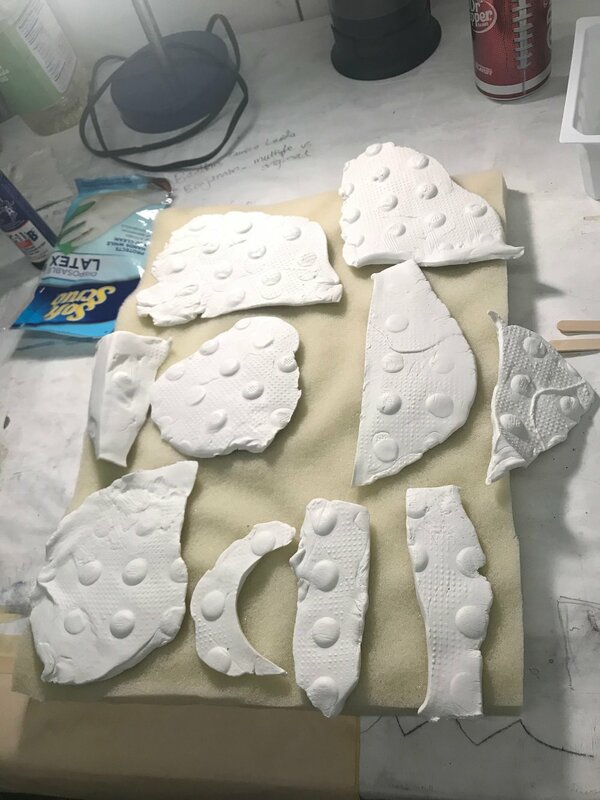 These blog posts will highlight my progress through a mold-making course, including making 1-part, 2-pt and gang molds using plaster and plasticine and casting in porcelain.